The Denver Broncos kicked off mandatory minicamp on Tuesday, starting early and staying into the evening. Absent (as expected) was left tackle Ryan Clady, who is recovering from shoulder surgery and negotiating his contract with the team (he is currently unsigned and unwilling to sign his franchise tag, instead seeking a long-term deal). 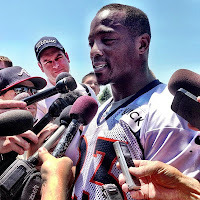 Present was veteran running back Willis McGahee, who had skipped "voluntary" organized team activities (OTAs). “I didn’t choose not to (attend OTAs). I had a reason: family reasons," McGahee said after practice on Tuesday. The Broncos were not quick to reinstate McGahee as the starter upon his return, however. As he had done throughout OTAs, second-year man Ronnie Hillman ran the first-team offense and shared carries with rookie Montee Ball. Despite his low carry count early in the offseason, McGahee said he did not regret missing OTAs, reiterating that he was absent due to "family reasons." McGahee, now 31, is recovering from knee surgery and is in danger of not making the cut this summer with youngsters Hillman and Ball emerging and Knowshon Moreno returning again. Understanding that the NFL is ultimately a business, McGahee is not fretting his situation. McGahee went on to note that there will always be competition at the running back position but that he expects to be the team's starting running back in Week 1 when the Broncos host the Baltimore Ravens in the season opener. Meanwhile, outside linebacker and pass rusher Shaun Phillips was absent on Tuesday, as he was reportedly excused for "personal reasons." Phillips is one of three former San Diego Chargers that signed with the Broncos this offseason. Present but not participating were tight end Joel Dreessen (knee), offensive guard Chris Kuper (ankle), center J.D. Walton (ankle) and safety Quinton Carter (knee). All four players are aiming to be back in time for training camp later this summer.